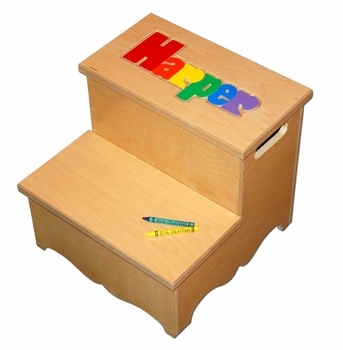 This personalized baby gift is a step up puzzle seat with baby's name built right into the top step. Made in the USA of solid hardwood. Measures 12 3/4 inches tall, 13 3/4 inches wide, and 13 1/2 inches long. Choose from primary or pastel letter colors. All finishes used in its construction are water based and non-toxic. To make this gift even more special, you have the option to have us engrave your personal message or the child�s birth information on the riser of the top step. Click on More Images above to see the engraving options and the pastel colors option. I was very impressed with the quality of this stool. It is very well made and just as described.